Modular home set with side adjacent to street. With garage addition to end, lot and home appear to be much larger. Modular home w/ detached garage. Located in Palm Desert Greens Country Club. and build an extension of you! Modular home w/ garage. False front w/ lattice breezeway creates a completed look while also allowing more light. Southern California modular home and park model dealer. Featuring Silvercrest, Hallmark and Fleetwood Homes. 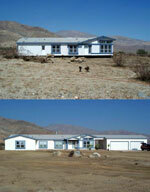 Modular home with garage set at front of lot made great use of this oddly shaped lot. It includes a vaulted ceiling with window treatments. Yes, this is a mobile home.